Solar energy! The sun can provide clean energy and can save you money. 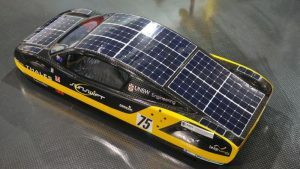 Find out from solar expert Jack Martin how he won a solar car race with a vehicle he built, and why. Community College teacher “Sustainable Jack”, who has taught solar installation to thousands, discusses alternative energy and environmental issues on his show “Home Power Radio Hour” every week on our affiliate radio station WCOM-LP in Chapel Hill, North Carolina. From another of our affiliate radio stations, WGRN FM Community Radio out of Columbus, Ohio, we interview community radio founder Eugene Beer. Bringing the two solar pioneers and community radio champions into our studio in Santa Cruz, California with their long-time friend “Cosmic Joe” yields a fun and far ranging conversation from solar ferries and boats, advanced vehicles of all sorts, frontiers of electric power, and – as Jack says, “Bringing The Hope of Sustainability to a Terminal Culture.” Tune in for all of this, plus Joe’s usual astronomical gems and scientific brain teasers.